We would like to congratulate our Gracie Jiu-Jitsu and Mixed Martial Arts Instructor for his well deserved promotion to Black Belt Under Luiz Palhares at our Seminar yesterday. This is 18 year journey for Jay Speight, and we hope that Jay will enjoy many years promoting the truly effectiveness of Gracie Jiu-Jitsu. 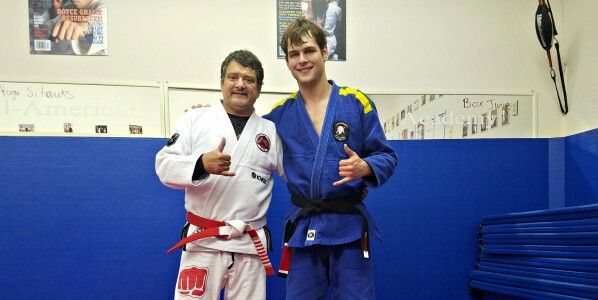 Jay Speight has been a student himself of Gracie Brazilian Jiu-Jitsu since he was 6 years old. He is a seasoned National and International champion in Jiu-Jujitsu and have too many titles to mention. In Mixed Martial Arts he has an undefeated professional record of 3-0 and as an amateur fighter, he had a 12-2 record. His only two losses were by judges decision, his wins were by submission or knockout. He has been fighting in MMA since he was 16 years old. He is always ready to help his students to attain their goals.